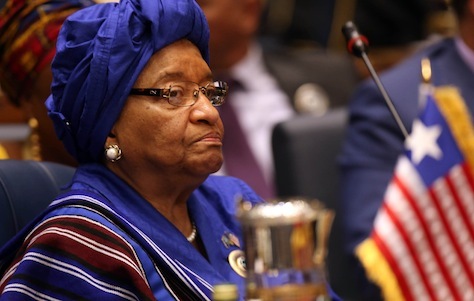 As Sirleaf pushes for more power, could Ebola victimize Liberian democracy? Photo credit to Yazzer al-Zayyat / Getty Images. 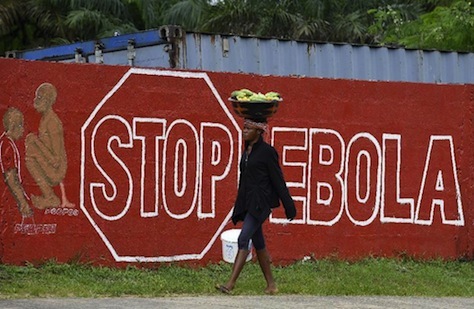 If there’s a silver lining to the current Ebola epidemic sweeping through Liberia and Sierra Leone, it’s that it’s happening in 2014 and not in 2000, when the two countries were embroiled in devastating civil wars, complete with civilian deaths and the use of child soldiers. But since March, when the Ebola virus first traveled from Guinea to northwestern Liberia and especially since June, when the first Ebola cases arrived in the capital city of Monrovia, Liberia has increasingly been stuck in the kind of siege mentality that residents though they’d left behind with the end of the civil war in 2002. Many of Liberia’s nearly 4.1 million residents have been subject to a nighttime curfew from 9 p.m. to 8 a.m. Liberian children are no longer attending school, business and hospitals are not functioning at capacity, and mass transit is reduced to a trickle. Some reports add that robberies are on the rise, in part because of the curfew. Out of over 8,000 reported cases of Ebola infection (as of October 5), just over 3,900 come from Liberia, which has also reported 2,210 of 3,866 total reported deaths from Ebola. Those numbers don’t include many unreported cases of Ebola infection, and the US Centers for Disease Control estimates that the number of reported cases in both Liberia and Sierra Leone could reach 550,000 by January (or up to 1.4 million, including underreported cases). The only person to inadvertently enter the United States with Ebola (so far) was a Liberia — 42-year-old Thomas Eric Duncan, who died in a Dallas hospital on Wednesday morning after flying to Texas from Monrovia late last month. Liberia will be the chief battleground for a US military force of up to 4,000 troops, who will attempt to ameliorate some of the bottlenecks in getting food and medical supplies to health care workers throughout the country. Photo credit to Pascal Guyot / AFP. The socioeconomic costs of the Ebola epidemic are, unsurprisingly, rising sharply. The World Bank yesterday reported that the impact to Liberia’s economy in 2014 could amount to $66 million (3.4% of GDP) and between $113 million and $234 million (5.8% to 12%) in 2015. Liberia imports much of its food, and prices for food are rising higher as fewer shipments are delivered to ports as Ebola infections increase. With a GDP per capita of between $450 and $475, Liberians hardly have a margin for much higher prices. In the meanwhile, with many hospitals closed, due to lack of equipment to handle potential Ebola victims, or simply due to fear, everyday illnesses common to the region are being left untreated, including everything from routine pregnancies to malaria, which manifests similar symptoms to Ebola and which peaks in September and October.